Village grocer, ironmonger and wine and spirits merchant that became known for its whisky. George Strachan is a family-owned, Scottish grocer and wine and spirit merchant based in Aboyne, Aberdeenshire, with two retail outlets on Golf Road in Ballater and Ballater Road in Aboyne. 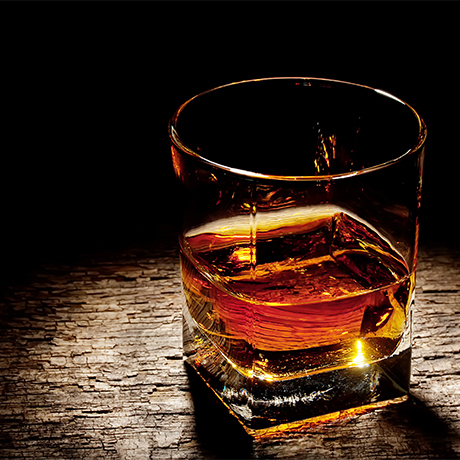 As well as selling all manner of items from cheese and preserves through to ironmongery and electricals, the multifarious business has been bottling whiskies since at least the 1960s, from blended Scotch to single malts and single grains. George Strachan reveals its Highland sense of humour through the names of its blended brands, which include Old Cobblers, Heebie Jeebies, Grog Blossom and Pheasant Plucker. However, the merchant has also proven itself a serious independent bottler, having been well ahead of its time in bottling well-aged, high-strength whiskies, such as a 39-year-old Mortlach at 86 proof (49.1% abv), as early as the 1970s. George Strachan also bottled single grain whiskies from North Of Scotland and Cambus in the early 1980s, also an unusual practice given the general disinterest many of the early independent bottlers paid to grain whisky at the time. The merchant’s outlets have proven popular with royalty over the years, with visits paid by members of the royal family while staying at nearby Balmoral Castle. George Strachan has received Royal Warrants from Queen Elizabeth II and Prince Charles, which are still active, and also previously held a Royal Warrant from the Queen Mother between 1974 and 2007. George Strachan Ltd was founded in Royal Deeside by George and Mary Strachan in 1926, and was later incorporated in 1950 as a ‘family grocer, wine merchant, fruiterer, fish merchant, and ironmonger’. It began bottling its own whiskies around the late 1960s, and released a series of single grain expressions under its own label in 1981-82. In 2011 the company’s Braemar shop – the one most proximate to Balmoral and frequented by the royal family – closed down. At the time George Strachan cited the prevailing economic climate and competition from online deliveries offered by the new Asda superstore, which had opened near the village. George Strachan passed away in 1995, followed by his wife, Mary, in 2016. Today the business is run by their son, George William Strachan.